Wishing to learn how to make a top table design with roses and rose guest table arrangements to match the bridal flowers for the wedding reception venue, then this course is correct for you. The top table arrangement is the floral focal point at the reception which is why it is so important to create a stunning display to add that air of distinction. Beautiful table décor also add to the beauty and celebration at a wedding. The course will cover: the techniques required to construct a top table arrangement and guest table décor, Conditioning, packaging and storing methods, what to consider when designing table décor, costing and delivery considerations. 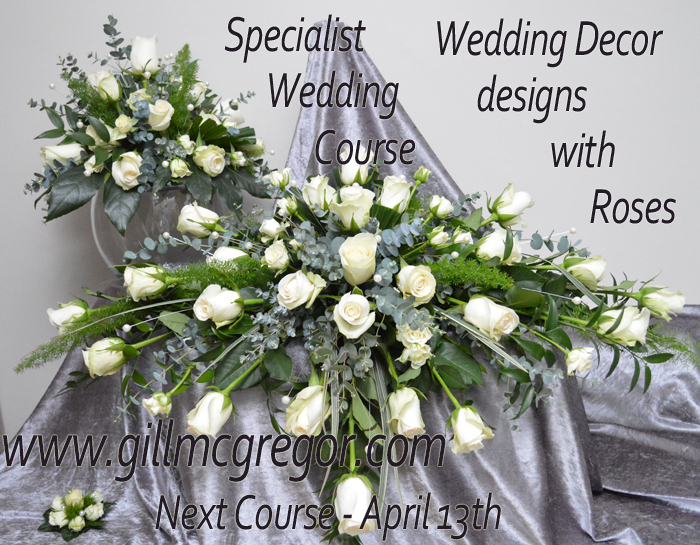 This fun, hands on course will teach you how to add the romance of roses for that special wedding day. Whether you wish to embark on a new career in floristry, either as business owner or as an employee, maybe to make designs for a one off event, or just want to 'test' your ability to learn floristry, Gill provides a number of different floristry options that include 1 day, 2 day and 3 day courses. You can also choose 'One-to-One' or ' You-&-Colleague' (or friend) - which helps to reduce your individual costs. There are many types of course from wedding to funeral, venue decorating to corsages and buttonholes. Contact Gill to discuss what you wish to learn and with some dates that are suitable to you, in discussion arrive at mutually agreeable dates. Gill can then talk you through your different options including the cost of tuition and cost of materials that will be required.